Add Arc - draw arc with clicks in drawing area or press "d" on keyboard for definition of arc in dialog. Arc can be drawn as definition of Start/End/Radius or Start/End/Center. Add Circle - draw circle with clicks in drawing area or press "d" on keyboard for definition of circle in dialog. Circle can be drawn as definition of Center/Radius or Start/Center. 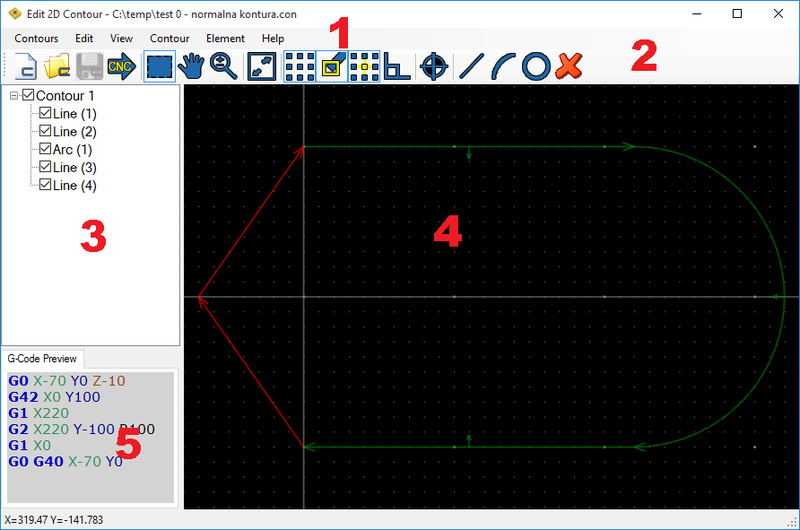 Convert to Line - convert selected element to line (rapid or machining move). You can use keyboard shortcuts 0 and 1. Convert to Arc - convert selected element to arc (G2 or G3). You can use keyboard shortcuts (2 or 3). Enter radius of arc in dialog. Tool Radius Compensation - turn on/off tool radius compensation (G41/G42). You can use keyboard direction arrows as shortcuts. Copy from Background - select element from DXF file loaded as background. Selected element becomes part of machining contour. Rotate - rotate selected element(s) - select origin point of rotation and angle. You can define whether to copy elements or not. Mirror - mirror selected element(s) - select two points of mirroring line. You can define whether to copy elements or not.